Celebrate the Cleveland Indians and a love of this all-American game with our Personalized Family Cheer wall decor. 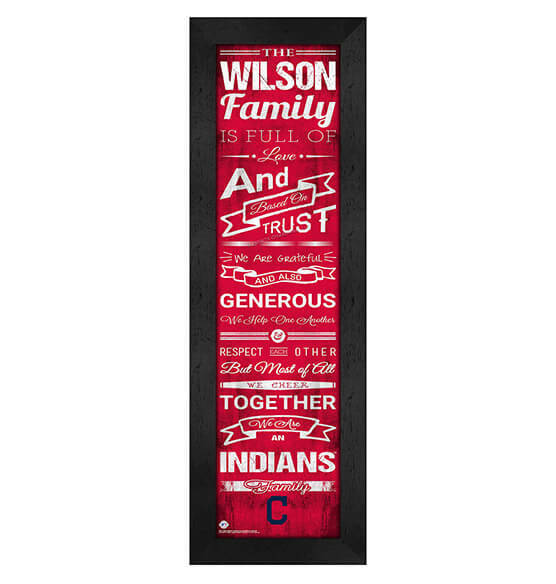 Ideal to buy for yourself or as a meaningful gift, this easy-to-customize wall decor highlights the love and devotion of one's family in iconic Cleveland Indians team colors. They'll enjoy this high-quality MDF vinyl-wrapped frame, glass and paper that comes ready to hang with a sawtooth hanger for easy decorating with baseball sports decor. Whether the recipient is a Cleveland, Ohio native or has adopted this American League (AL) Central division team as their own, this will be a truly special baseball gift that will be cherished.